I believe it is the first time. Did they ever say why they did this? I know it will offend some but I absolulety love this combo. I find it so so so stupid that the policy of these boards is that one can praise racist logos but one can't criticize racist logos. I can. It’s got crummy linework in the teeth and ears, the feather is poorly-rendered, and the pupils look off. It’s ugly for both aesthetic and moral reasons. I don't think this policy exists. I don't like the combo. Too much navy blue where there otherwise wouldn't be: the scripts, names, and numbers on the white and navy are red, so they should be red here, too. Talking purely about the logo’s aesthetics without talking about what it means is such a bad-faith exercise. You wouldn’t do that with any other logo. No analysis of the aesthetics of the Colorado Rockies “CR” interlock is complete without an acknowledgement of the fact it combines city name and team name. No analysis of Chief Wahoo is complete without an acknowledgement that it’s a horrifically racist caricature. You can’t talk about the bright red skin without talking about the bright red skin. What fans? Most of us don't have the same emotional attachments to Wahoo as Indians season ticket holders in remote NE Ohio suburbs. Honestly, I'm over the whole "Is Wahoo racist?" debate. There are so many other reasons why Wahoo should have stayed gone in the 80s when the Indians got rid of him the first time. The Braves got rid of their similar logo around the same time and shifted the focus of their brand to the tomahawk, which I think we can all agree was probably one of the better decisions they've made regarding their brand. 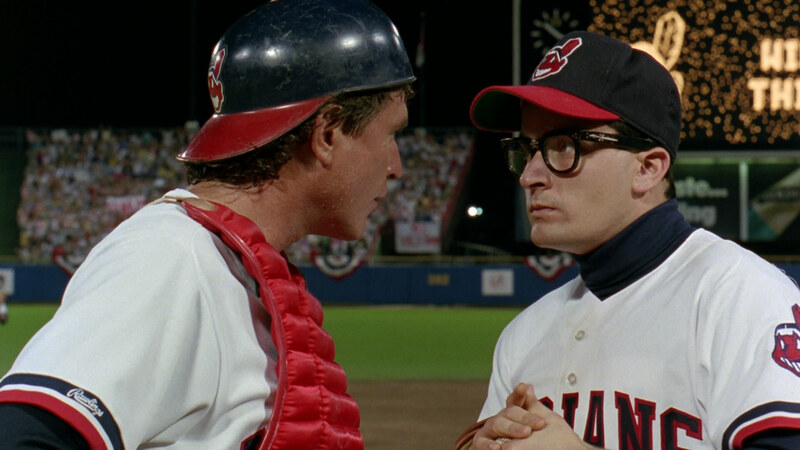 In hindsight, Cleveland probably should have gone a similar route as the teams in Spokane and Indianapolis. Instead they dug themselves a hole that will alienate fans either way. And over a mark that doesn't even represent a particularly good era of Cleveland baseball. They did this to themeselves. In hindsight, Cleveland probably should have gone a similar route as the teams in Spokane and Indianapolis. Instead they dug themselves a hole that will alienate fans either way. And over a mark that doesn't even represent a particularly good era of Cleveland baseball. Honestly, I think there's only reason why the Indians have kept this logo. The Wahoo logo may not represent a particularly good era of Cleveland baseball, but it represents a famous one. Immortalized in pop culture, frozen in amber. Therein lies the other problem with Wahoo... it actually works way better for a fake team from a sports comedy than an actual real life team. I feel like the Durham Bulls have suffered in a similar vein. They're now joined at the hip to a 1980s logo that is showing its age (though not nearly as bad as Wahoo). At least the NHL's Mighty Ducks logo didn't show up until the sequels. That's always been my stance. It's not a good logo, and certainly not a respectful one, but because of the movie, you gotta have some place in your heart for it. It's time for it to go, but I hope no one feels any pressure to, like, blur it out of the movie or something. I'm no mod, but some of you guys are starting to veer off course...might want to correct course soon if you catch my drift. i’d love for a mod to explain to us how someone is supposed to talk about the shade of red in Chief Wahoo without talking about the shade of red in Chief Wahoo. Or the cartoonishly large teeth. Or the feather. Or the logo origins. Or how people perceive it. Either ban ban any discussion of any Native American themed sports identity or allow all of it. It's already banned in the board guidelines. Earlier on, it seemed people were talking about the aesthetics of the Cleveland road uniform set, but this is veering into the politics behind the Chief Wahoo logo and the nickname. And we've proven time and again that such discussions can't be civil. I don't want to shut down a longstanding and useful thread such as this, so consider this a warning to all to drop the debate about the logo and the nickname. We all love to talk about sports design. We love to go *all the way. * talking about the tiniest of details. The most minuscule aspects. I don’t believe you can really, fully talk about the Cleveland Indians road uniform hat/jersey combo without talking about that part of Chief Wahoo. You should ban ban any discussion of the Cleveland Indians at all if you’re going to ban one, critical part of it. We can’t really engage sports design otherwise. Yes, you can. You choose not to. This community (I'm not signalling anyone out specifically) has proven incapable of discussing the Native identity issue in sports without resorting to name calling and hyperbole. This runs counter to what we as moderators and administrators want for this community. And let's be clear. The community has had multiple chances to have the discussion about sports teams using Native names and imagery in their brands. And it almost always devolves into a flame war. So we're just going to ban the discussion. Simple, really. You've now had three mods come by to tell you to drop this line of discussion. I would advise that you listen. Well, since literally nobody has called for that, I think we're okay. There are plenty of racist caricatures allowed to remain in movies. Hell, if Breakfast at Tiffany's can continue to exist, which has one of the most insanely racist performances ever captured on celluloid, then I think Major League is probably pretty safe. I thought Breakfast at Tiffany's was a very flattering portrayal of Prostitute-Americans.